Given that I'm now taking a more personal approach to my blog, as opposed to just sharing my photography, I thought it would be a good idea to share a few facts about me as a way of getting to know me a bit better. I have also recently updated my About page, where you'll find a few snippets also. ONE | My name is Jade, as I'm sure you gathered from my blog title, I'm 25 years old, and I'm currently a stay at home mum. TWO | I was born and raised in London but have settled down with my own family in the South Wales Valleys - my partner and I moved to Wales in the summer of 2013 when I was pregnant. THREE | I drink far too much tea... Like copious amounts. I only drink regular black tea though - milk, no sugar. One of my son's first words was actually tea. FOUR | I'm a big reader. I tend to read at least once a day, and often finish a book or more a week depending on length. As well as Captured By Jade, I do also have a book blog where I share a bunch of bookish content. FIVE | I have anxiety. I have generalised anxiety but with an emphasis on social anxiety. I was officially diagnosed with this in my late teens, and back then it greatly impacted on my life - to the point that I couldn't even leave the house on my own. Thankfully since then I have had great support and treatment (CBT) that has really helped me to deal with my anxiety on a daily basis. Being a parent with social anxiety is not easy, but in many ways I feel like being a parent has helped with my anxiety also. SIX | I'm a twenty five year old woman who loves all things Disney - the films, the parks, the Imagineering, and so much more. I've been to Disney World once, when I was 14, and I'm desperate to return again with toddler in tow. Until we get there, which won't be for a while being a one income family, I live vicariously through Disney vlogs on YouTube... I'm kind of a little obsessed with them. SEVEN | As I mentioned above, we are a one income family (out of choice), and so budgeting and keeping check of finance is really important. I've always really enjoyed organising and budgeting money, and have even made budgets for friends and family in order to help get their finances back on track. I say I enjoy it, but really I actually find it quite fun. EIGHT | I love organising in general. We live in a small cottage in what was a miners village, and so you can imagine space is limited, but I love reorganising our things every now and then and being sure that everything is organised efficiently etc. I'm forever reorganising my bookshelves and the kitchen cupboards and under the stairs, and just everywhere really! NINE | I collect coins, well really that's we collect coins, Nathan and I. We have a small collection of rare coins that are in circulation but limited amounts made. We don't seek out these coins, but we are change checkers. It all began with the Charles Dickens £2 coin and has progressed from there. We have a good few 50p's also - my favourite is the Peter Rabbit one. TEN | This is a more recent thing of mine, but I'm obsessed with conspiracy theories. Not any specific theories, but just conspiracy theories in general. And yes, whilst some of them are kind of crazy and out there, I find conspiracies theories really make me think about things and to look beyond the surface level appearance of things. ELEVEN | By the seaside is one of my all time favourite places to be, but I wouldn't want to live there. I love living around greenery and escaping to the seaside. It's the kind of change of scenery that leaves me returning home rejuvenated. TWELVE | I'm a very simple eater. I do cook a variety of food for my family, and of course it's important for a growing child to experience and taste new and different things, but if we ate what I wanted we'd largely live on cereal, jacket potatoes, sandwiches, soup, stir fry, rice/quinoa bowls and fruit & veg of course. THIRTEEN | My mug collection is bordering on ridiculous, but I do drink plenty of tea so they are all well used mugs, so that makes it okay, right?! FOURTEEN | My favourite number is seven. FIFTEEN | My favourite season is autumn, especially with the seasonal shift, but my favourite time of year is definitely Christmas. SIXTEEN | I love caravan holidays. I know for many people it is probably their nightmare, but I personally love them. We went on a bunch of caravan holidays when younger, and I'm sure as our family of three we'll go on plenty of them too. I can't pinpoint what exactly I love about them though... It's obviously a mixture of things combined. SEVENTEEN | This sort of ties in with the above point - I'm a big staycation advocate. Don't get me wrong, there are plenty of places I hope to visit overseas some day, but I'm also keen to discover more of the UK as our own country has an abundance of beauty and places to explore. EIGHTEEN | If you couldn't already tell, I love nature and the great outdoors. NINETEEN | I'm a jeans, t-shirt and hoody/sweatshirt kind of girl. I'm all for being bundled up and cosy. The same goes for at home... I love being all snuggly in a blanket. TWENTY | I have two tattoos. My first tattoo is on the inside side of my left wrist (if that makes sense); the tattoo is of five hearts decreasing in size and fading in colour from red to pink. It has a hand drawn effect, which I wanted, and is often mistaken by people as just that, a doodle. My second tattoo is behind my right ear, and is the initial N in a fancy writing style. TWENTY ONE | I cannot drive, and have no intention of ever learning. I know some people would be lost without a car, but I feel like living in the UK it isn't a necessity like some other countries, and I would be a far too anxious driver. Honestly, it is safer without me on the roads! TWENTY TWO | Daisies are my favourite flower, and I love wildflowers in general. TWENTY THREE | We don't own a TV - I feel like this is perhaps becoming more and more of a common thing. I don't feel like I'm at a loss not having a TV; we still watch movies, we have Netflix, we can catch up with certain shows online, and I feel like I'm a lot more productive than we if we did have a TV. TWENTY FOUR | I'm such a morning person. I'm at my most productive in the morning, and when I have things to do I always get them done first thing. I'm definitely someone who slumps after the 2 or 3 o'clock mark, and that's why I get a lot of things done in the morning. This especially applies to housework! TWENTY FIVE | I'm still very much someone who has no idea what they're doing with life... But what I do know is that I'm very happy and thankful to be figuring it out with our little family of three. 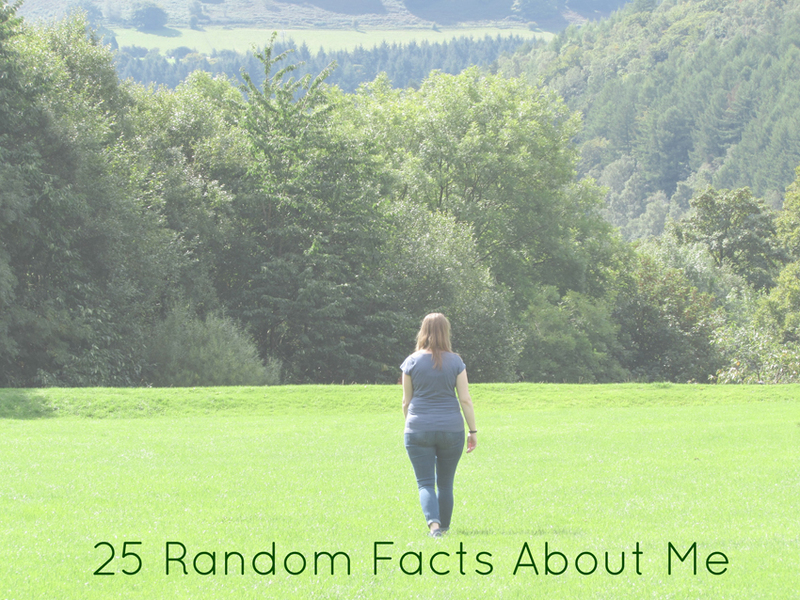 BE SURE TO SHARE SOME FACTS ABOUT YOU IN THE COMMENTS! Haha - yes, I do remember you mentioning the coins before! We do have a good deal in common; I agree. Ah, see that's what I was going for with the placement of my tattoos; they aren't easily visible. Hence why you didn't notice them when we met. I love tattoos in general - I come from a family with A LOT of tattoos - but I wanted mine easily coverable for work and such. I go in and out of phases with my books, and of course I don't work right now so I'm sure I have a fair bit more spare time than you do with the blog, work, little one etc. Thank you, Polly! I'm looking forward to hearing more about your travels in India! Jade, you are a very courageous soul to share so much about yourself. I sharing photos of things and thoughts that may give you a glimpse of me, but that it. Be happy and make your life the best that it can be.